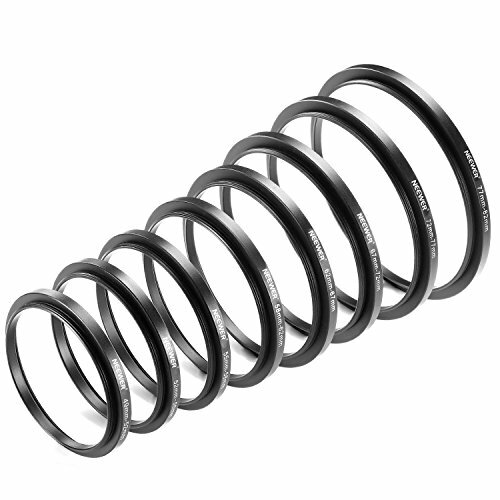 The Step-up Ring Set includes: (1)49-52mm step-up ring + (1)52-55mm step-up ring + (1)55-58mm step-up ring + (1) 58-62mm step-up ring + (1)62-67mm step-up ring + (1)67-72mm step-up ring + (1)72-77mm step-up ring + (1)77-82mm step-up ring. Provide a way to fit larger diameter filters or accessories onto a smaller lens. Made of premium grade aluminum, and precision production ensures smooth mounting. Extremely solid and lightweight, polished and finished with anodized matte surface. Fit any lens with the same filter thread, manual or autofocus, digital or film. 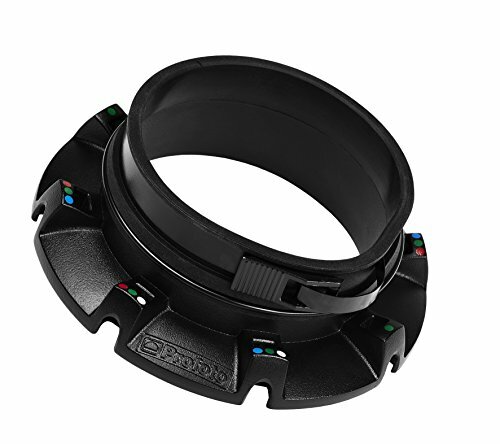 Stepping Adapter Ring Kit: A must have accessory to unlock the full potential of your camera. Solid and light-weight. Easily screw onto the front of the lens. The first number is always the lens thread size, the second number is the filter size of the accessory. If the first number is bigger, it's a step-down ring. If the first number is smaller, it's a step-up. 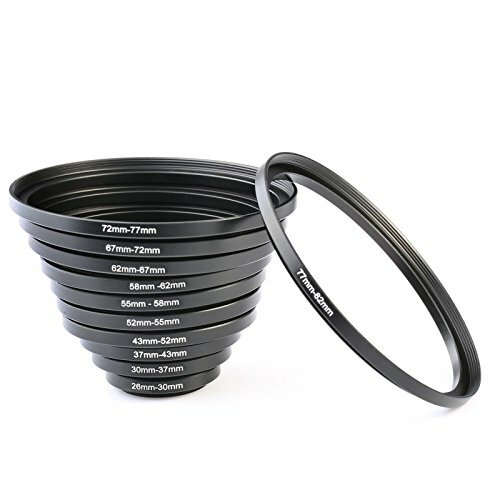 Give you the ability to connect screw-in filters to different size lenses. For instance, you can connect a 72mm filter to a 67mm lens by placing the 67-72mm ring on the lens and then screw the filter onto the step-up ring. You can connect a 67mm filter to a 72mm lens by placing the 72-67mm ring on the lens and then screw the filter onto the step-down ring. 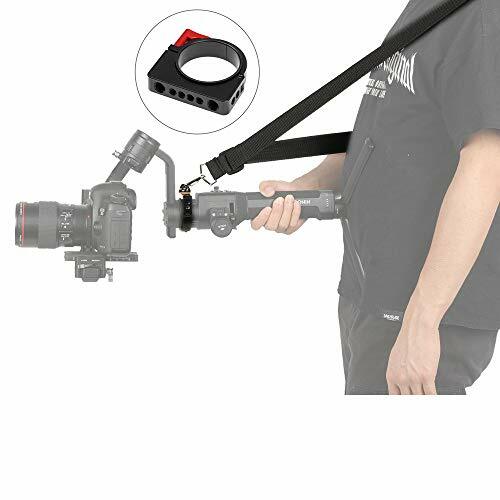 Specifically designed for your camera for a tight and secure fit. No wobbling or cross-threading. NOTE: Please verify your camera's lens thread size. Your camera's lens thread size will be marked somewhere on the lens barrel or printed underneath your lens cap. This number is always preceded by a "?" (diameter) symbol. For example: ?37 = 37mm lens thread size. 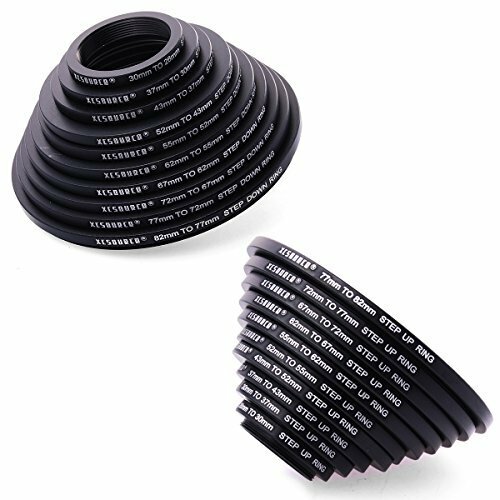 The Stepping Adapter Ring Kit includes: 10 Pieces Step-up Adapter Ring Set (26-30mm, 30-37mm, 37-43mm, 43-52mm, 52-55mm, 55-62mm, 62-67mm, 67-72mm, 72-77mm, 77-82mm) + 10 Pieces Step-down Adapter Ring Set (82-77mm, 77-72mm, 72-67mm, 67-62mm, 62-55mm, 55-52mm, 52-43mm, 43-37mm, 37-30mm, 30-26mm). Anodized matte finish to compliment your camera. Fit any lens with the same filter thread; manual or autofocus, digital or film. Convert the thread size of your lens to the thread size of any other accessory (such as filters, hoods, flashes and lens converters). Dedicated to provide products in high quality & good price. 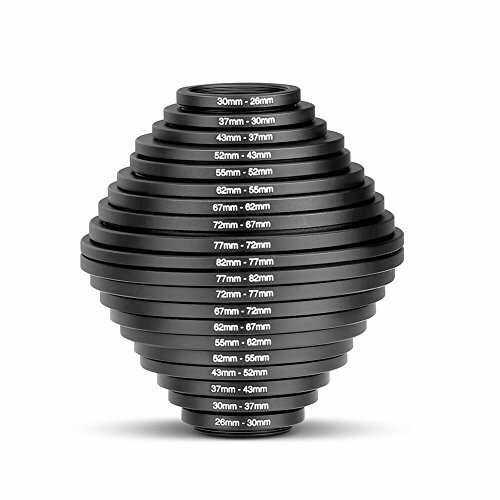 Fits any lens with the same filter thread; manual or autofocus, digital or film. The first number is always the lens thread size, the second number is the filter size of the accessory. If the first number is bigger, it's a step-down ring. Compatible with the Canon, Nikon, Sigma, Tamron,Sony,Fuji Camera lens. Precision made from premium-grade aluminum,solid and light-weight. Great tightness, no wobbling or cross-threading. The first number is always the lens thread size, the second number is the filter size of the accessory. If the first number is smaller, it's a step-up. 1.The first number is always the lens thread size, the second number is the filter size of the accessory. If the first number is bigger, it's a step-down ring. If the first number is smaller, it's a step-up. 2.Give you the ability to connect screw-in filters to different size lenses. For instance, you can connect a 67mm filter to a 72mm lens by placing the 72-67MM ring on the lens and then screw the filter onto the step-down ring. 3.Please verify your camera's lens thread size. Your camera's lens thread size will be marked somewhere on the lens barrel or printed underneath your lens cap. This number is always preceded by a " " (diameter) symbol. For example: 37 = 37mm lens thread size. 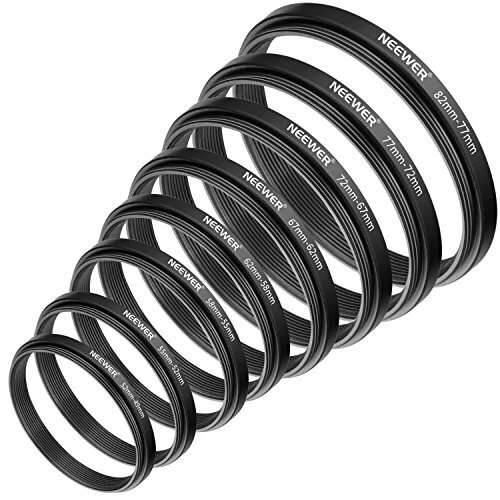 Neewer Step-down Filter Adapter Ring Set can easily screw onto the front of any lens, and convert the thread size of your lens to the thread size of any other accessory, such as filters, hoods, flashes and lens converters. Provide a way to fit smaller diameter filters or accessories onto a larger lens. Fit most lens with the same filter thread, manual or autofocus, digital or film. The Speedring for OCF Flash Heads from Profoto is part of the Off-Camera Flash system developed for the B2 head but also compatible with the B1 Off-Camera Flash. The speedring has been scaled down and fitted with an easy patent-pending snap-in system for the softbox rods while the hard rubber collar has been replaced with a lighter weight silicone rubber substitute. The speedring and optional softbox are able to rotate 360 degrees. 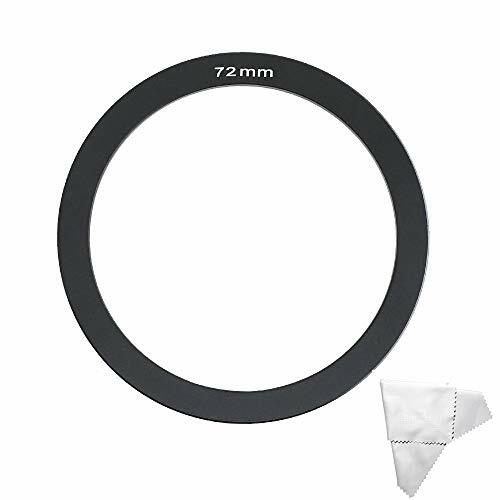 LEE Filters Wide Angle 77mm Adapter Ring. 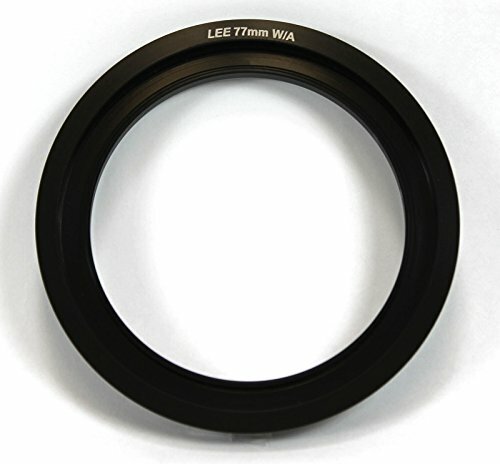 The adapter ring is crucial to the LEE 100mm Filters system. It screws onto the camera's lens and the Lee 100mm FK Foundation Kit Holder is then secured to the adapter ring with the 3 part spring loaded brass wedge. 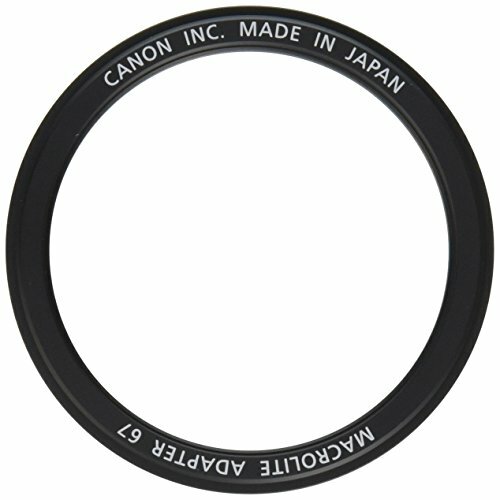 The wide angle adapter ring is suitable for use with wide angle lenses. It differs from the standard adapter ring by sitting closer to the front element of the camera's lens, as the threads are recessed into the adapter ring so that the adapter ring slightly overlaps the lens. As a result, the likelihood of vignetting is dramatically reduced. 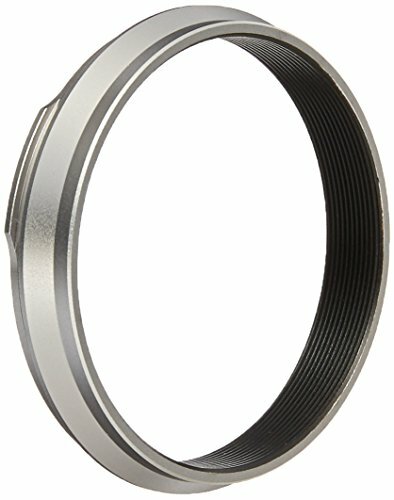 The wide angle adapter ring could really be considered a universal adapter ring as it can be used on any lens, even if it is not a wide angle lens. PLEASE NOTE: This is not compatible with the Lee Seven 5 or SW150 Filter systems. The Cokin Creative Filter System consists of a rectangular plastic filter holder with four slots (one for Cokin rotating filters and three for rectangular ones), a variety of optional adapter rings which click into place and rotate, and many optical resin filters. Compatible with Canon MR-14EX and MT-24EX Speedlites. For attaching them to the Canon 100mm f2.8 L Macro IS USM EF lens. 67mm thread for attaching to the filter thread of the lens. Weight is approx 20 grams. Great little piece of equipment to own for any photographer or videographer. 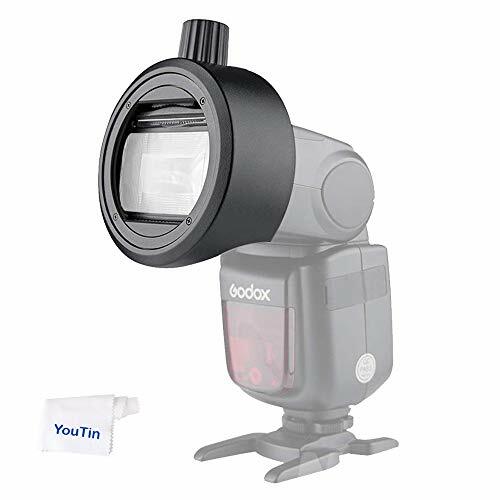 The ring adapter easily screws onto the front of any lens, and converts the thread size of your lens to the thread size of any other accessory (such as filters, hoods, flashes and lens converters). Made of high quality anodized black aluminum (metal). Color: Black. Extremely solid and lightweight. Specifically designed for your camera for a tight and secure fit. No wobbling or cross-threading. Your camera's lens thread size will be marked somewhere on the lens barrel. This number is always preceded by a "?" (diameter) symbol. For example: ?37 = 37mm lens thread size. This number can also often be found printed on the back side of your lens cap. The first number is always the lens thread size, the second number is the filter size of the accessory. If the first number is bigger, it's a step-down ring. If the first number is smaller, it's a step-up. A must have accessory to unlock the full potential of your camera! Accessory only. Camera and filter UV not included. What's in the box 1*SIOTI Aluminum Adapter Ring for lens. This 72mm P Series Filter Holder Adapter ring screws onto the lens' front threads of the same diameter and enables the Cokin P Series Adapter Ring to attach to the P series Filter Holder. Once the adapter and holder are attached to the lens filters can be slid into the holder and be used accordingly. 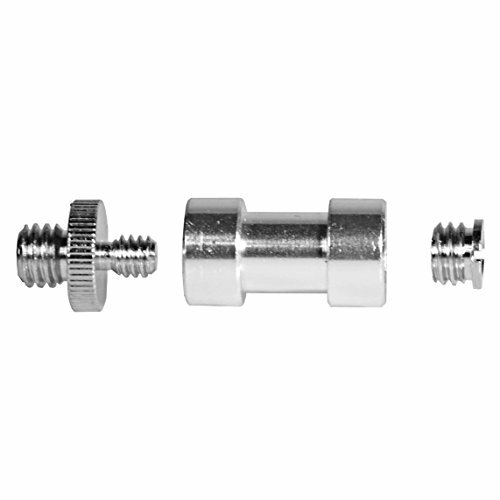 The adapter ring is made from aluminum, which has been anodized for durability. Fine finish and Anodized Aluminum Material Made. Smooth Filter Thread, Enables Use of Cokin P Series Filter Holder. 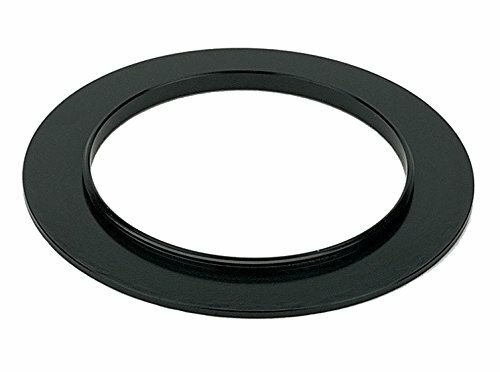 NOTE: This adaptor ring does not compatible with 100mm filters (4x4 square) holder. For any Lens with a 72mm Filter Mount, Just Screws Onto the Front of the Lens. 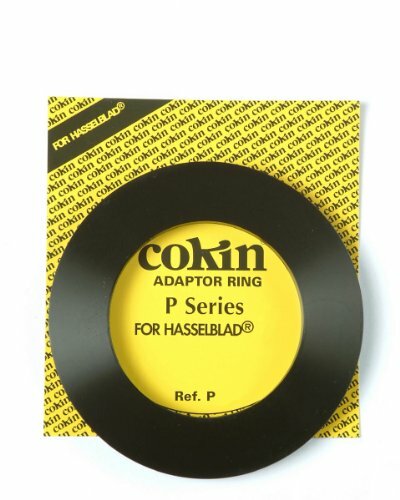 Provides a Secure Attachment, replaces the Original Filter Adapter Ring from Cokin. Each Package Comes with a Soft Fiber Cloth to wipe the lens or filter. This product also comes with 90 Days Money Back and 2 Years Manufacturer Warranty. SODIAL is a registered trademark. ONLY Authorized seller of SODIAL can sell under SODIAL listings.Our products will enhance your experience to unparalleled inspiration. 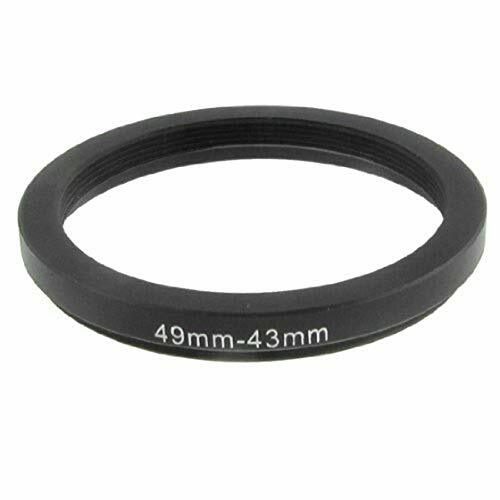 SODIAL(R) 49mm-43mm 49mm to 43mm Black Step Down Ring Adapter for CameraThe 49mm-43mm ring adapter easily screws onto the front of any 49mm lens, and converts the thread size of your lens to the thread size of any other 43mm accessory (such as filters, hoods, flashes and lens converters). 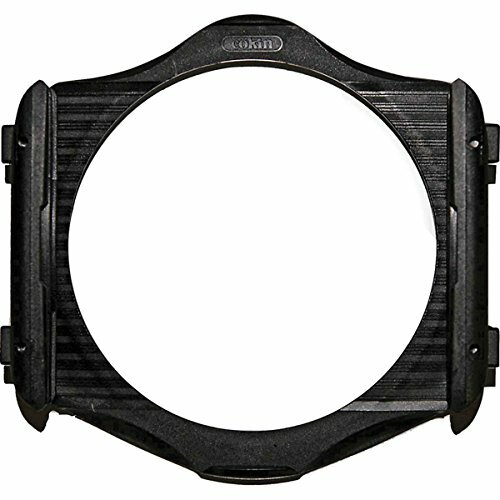 Product Name : Step Down Adapter Ring;Lens Side : 49mm/ 1.9"
* SODIAL is a registered trademark. ONLY Authorized seller of SODIAL can sell under SODIAL listings.Our products will enhance your experience to unparalleled inspiration. 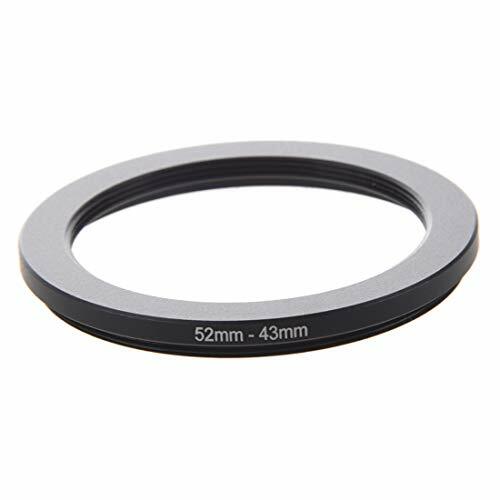 * SODIAL(R) 52mm-43mm 52mm to 43mm Black Step Down Ring Adapter for Camera. 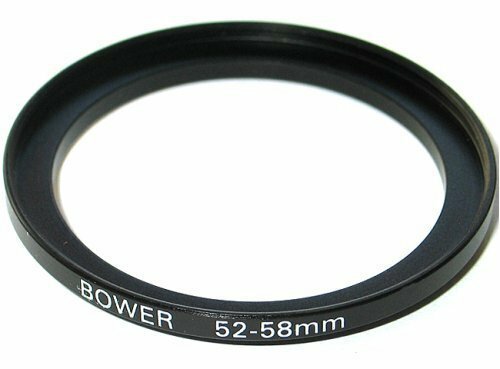 * The 52mm-43mm ring adapter easily screws onto the front of any 52mm lens, and converts the thread size of your lens to the thread size of any other 43mm accessory (such as filters, hoods, flashes and lens converters). 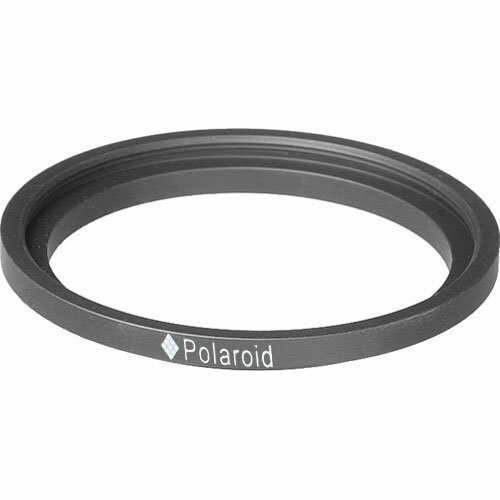 Product Name : Step Down Adapter Ring;Lens Side : 52mm/ 2"
The Polaroid Step Up Or Step Down Adapter Rings are a reliable and economical way to use filters and conversion lenses. 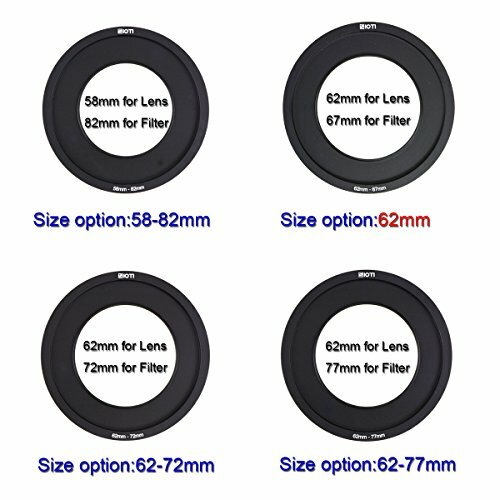 They allow you to use smaller size filters or conversion lenses on lenses or cameras with a larger diameter thread or vice versa it allows you to use a bigger size filter or conversion lens on a lens or camera with a smaller diameter thread . The first number is the size that screws into the lens and the second number is the filter size/mounting thread size. 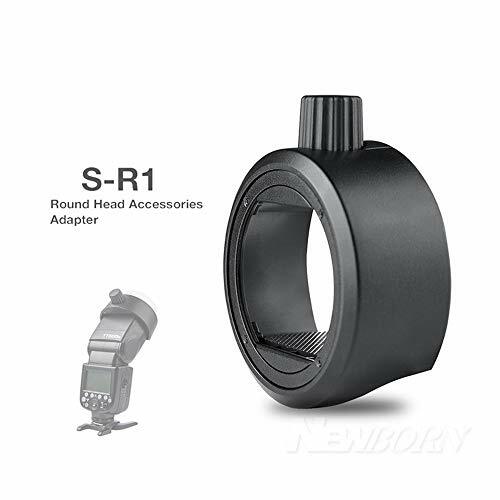 Round head accessories adapter S-R1 can make Godox camera flashes e.g. V860II,V850II,TT685 and TT600 series install AK-R1 round head accessories to achieve creative light effects. Godox S-R1 can also be attached on camera flashes of other brands e.g. Canon,Nikon,Sony,etc. 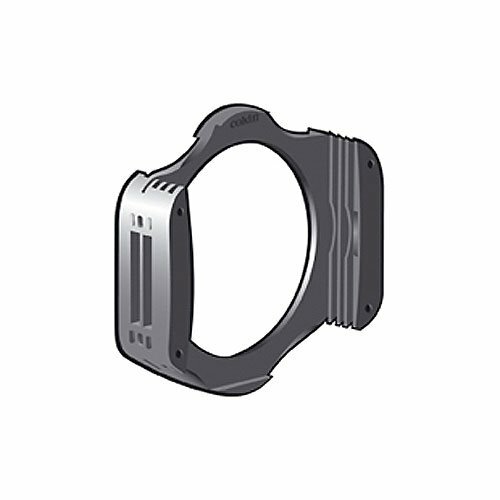 Applicable Accessories: It is suitable for AK-R1 round head accessories. Adjust the screw on the top to install camera flashes of different sizes. With grid rubber mats to tightly fix camera flashes and protect their surface. Allows you to use larger size filters on lenses with a smaller diameter thread. The first number is the size that screws into the lenses, The second number is the filter size. 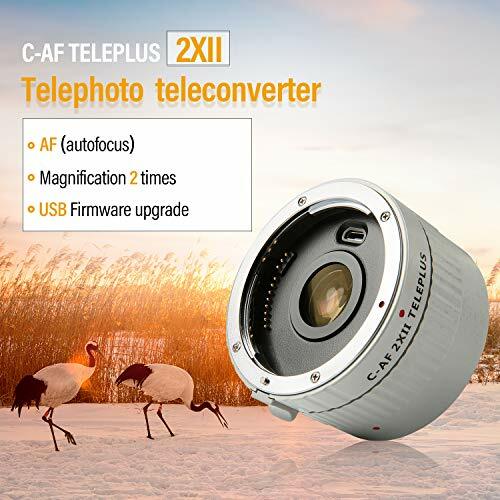 Viltrox C-AF 2XII TELEPLUS can make the focal length of all the for Canon EF lens increased to 2 times,and the auto-focus function of the original camera lens can be used perfectly, and don't change the EXIF information. C-AF 2XII specially use for 100mm or more fixed focal length lens, but not recommend for use in less than 60mm of short-focus lens. Can increase the original lens focus length to 2 times. Support lens' AF function (Auto Focus) and won't affect to Exif information. Adopt 7 optical glasses, 4 groups, the depth of field is half of the original lens. Good helper for long distance photography. With upgraded USB firmware interface. VILTROX C-AF 2XII increases the focal length of a lens by a factor of 2x while still delivering superb image quality. VILTROX C-AF 2XII is only compatible with fixed focal length L-series lenses 100mm and over, as well as the EF 70-200mm f/2.8L, EF 70-200mm f/2.8L IS, EF 70-200mm f/4L, and EF 100-400mm f/4.5-5.6L. Auto-focus works well as long as you have enough light ,and won't affect to Exif information. With upgraded USB firmware interface. Can upgrade firmware version regularly in order to be compatible with more and more new cameras and lenses .